To send and receive faxes with FaxTalk software, you’ll need a fax modem. Fax Modems are hardware devices that connect to your computer and allow you to connect to a standard analog telephone line. GetFaxing.com has compiled a list of recommended fax modems below. We’ve found that these modems have been to work reliably with the software from internal tests and reports from Thought Communications and our customers. If your fax modem is not on the list below it may work fine with the FaxTalk software, as the software includes extensive support for almost all of the different data/fax/voice modems standards that are available. FaxTalk is compatible with Class 1, Class 1.0, Class 2, Class 2.0 and Class 2.1 fax modems. You should be able to use FaxTalk software with just about any standard Class 1.x or 2.x modem without problem. Fax Modems are available in serial, USB, and PCI type slot interfaces. NOTE: CAPI compatible ISDN fax devices are not compatible with FaxTalk software. Fax modem configuration issues can impact the performance of the FaxTalk software. Problems with fax and voice messaging operations can sometimes be caused by using the generic modem drivers included with Microsoft operating system instead of using the included drivers provided by the modem manufacturer. In some installations, you should use the modem drivers that were provided with the fax modem and not let Windows automatically install generic drivers when you install the fax modem hardware. Generic drivers may not support Caller ID, Distinctive Ring or other advanced features of the fax modem. Before purchasing a fax modem, you should check with the vendor/manufacture for support of 32-bit and 64-bit Microsoft Windows Operating systems. If you are experiencing problems with using FaxTalk with a fax modem, contact our technical support for more info. Many older fax modems will work with FaxTalk, but you must check that they support and have updated drivers for your operating system. Some fax modems, especially software based modems do not include drivers for modern operating systems, and should be replaced with a compatible hardware based fax modem. You should avoid software based modems. They have been found to exhibit unreliable operations when used for faxing and voice messaging. 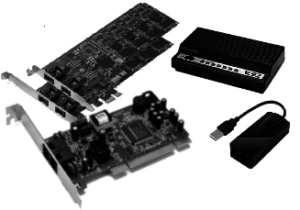 Many of these software based modem models have been found to be unreliable for use with Microsoft Windows 10 and can result in IRQ_NOT_LESS_EQUAL crashes of the operating system. GetFaxing.com has a supply of fax modems available that have been tested for use with FaxTalk and other dial up applications. If you require voice mail capability for use with FaxTalk Messenger Pro or FaxTalk Multiline Server, ensure the fax modem supports voice. These fax modems have also support Distinctive Ring and Caller ID in the United States and Canada. Caller ID support not available on all types of phone systems. It is possible to use multiple modems in a single computer, but avoid using more than one software based modem in an installation. Some modem manufacturers do not support multiple modems of the same brand/model in the same installation. If you require multiple phone line support, you can purchase a multi-line modem. IMPORTANT: Some Modem models listed above may be discontinued by the manufacturer and no longer provide support for newer operating systems. Check with the re-seller or manufacturer before purchasing a fax modem to ensure it supports your Windows operating system. multi-port fax modems support multiple phone lines, usually they support 2, 4, or 8 lines in a single internal card. These types of modems are used for high-volume faxing. IMPORTANT: Some multi-port models listed above may be discontinued by the manufacturer and no longer provide support for newer operating systems. Check with the re-seller or manufacturer before purchasing a fax modem to ensure it supports your Windows operating system.